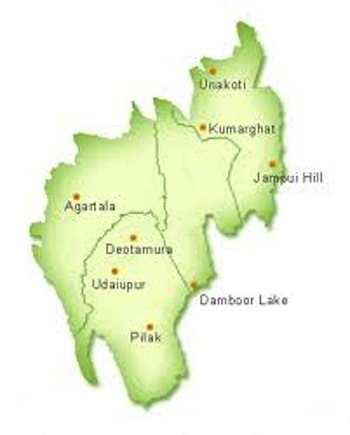 Tripura is located in a remote section of northeastern India. It’s almost completely bordered by Bangladesh, with the exception of its eastern side, which it shares with Indian States of Mizoram and Assam. It ‘s one of India’s smallest states with an area of only about 6,500 square miles! The state was ruled by Maharajas (stately kings) until it was conquered by force in 1761, during medieval India History. It went without a ruler until it was again ruled Maharajas under British control. After India’s very own Gandhi helped India gain its independence from Britain, it was an Indian union territory from 1956 to 1972. The state’s agriculture and industry sectors are underdeveloped and for that reason, much of its food is imported from nearby states. Even so, the economy here is primarily based off of agriculture. Agriculture employs about sixty percent of the state’s population, which was most recently estimated at about 30,000,000 people. Agricultural production here is very important and includes pineapples, oranges, cashews, coconuts, tea and even rubber. Fish and animals are not effectively raised and breaded here, which creates the need to import these foods. Most of the state is hilly and more than half the land is covered with trees. The temperature here ranges from 50 to 95 degrees Fahrenheit and an average annual rainfall of about 83 inches. The favorable weather makes and beautiful scenery give the state great tourism potential, but the state also needs to develop further in this area, perhaps by effectively marketing the land’s value and appeal. There is a rich culture that flourishes here; it includes various dance forms and other beautiful art to be discovered. In addition, its many Bengali temples and plush lands are excellent tourism destinations in themselves. Leave Tripura to explore other states of India.